Wanting a solution that provided protection from the elements, but also was not permanent and did not ruin the look of the porch, they contacted CB for advice and a solution. 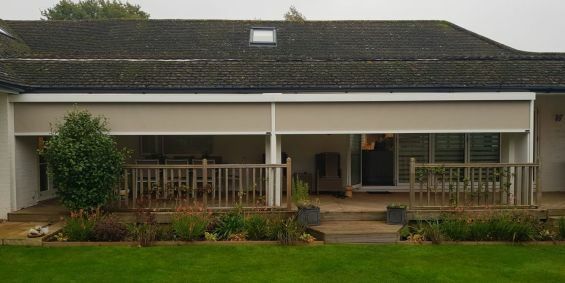 Our surveyor carried out a detail survey and designed our Antiguan model external roller blind which is a windproof screen system, set on custom spacers that stepped them off the front of the columns pushing them level with the boundary of the decking. Additionally, the cassette casing would have a bespoke extension to the rear to bridge the void between the casing and the guttering to ensure a seamless integration and watertight joint. Following installation the client dropped us the below email congratulating our teams communication with them throughout the process, particular important when purchasing a bespoke made to order product. If you like the McIntyres enjoy a personal service where you are kept in the centre of all communications and are considering an external shading system, then speak to one of our knowledgable experts today on 0344 800 1947 and enjoy a customer service experience like no other.